We have family pictures taken each year right before the hustle and bustle, so I love making photo gifts during the holidays. I’ve been making these Glass Photo Ornaments for quite sometime (even before the outburst of holiday projects on Pinterest). The are the perfect keepsake or gift. I’ve shared this craft with many and haven’t came across a tutorial that shows well how EASY it can be done. You will need- 1 photo (relative in the size to the ornament you’ve chose), 1 glass bulb, a stick (a pencil or skewer will do), fishing line, double sided tape, ribbon if you choose and white cardstock with the date printed or stamped. Find a drinking glass that your ornament will sit into (you want it to sit in about 1/4 of the way, a smaller circle is better than one too big), use this as a template for your circle. If you have another means of circle cutting, a large ornament will need a 3″ circle. Cut two circles, one from your photo and the other from the cardstock. Add names, dates, or sentiments to the paper circle, with your printer or stamps. Apply strips of (acid free) double sided tape to the photo. Cut a long piece of fishing line and fold it in half. Stick the looped end along the centre of the photo. Sandwich the fishing line between the two paper circles. Gently roll the photo into a tube (photo on the outside of the roll), and slide it into the ornament. Be sure there are no sharp points of glass that the photo will get scratched by. Hold onto the fishing line and run the stick back and forth over the photo to flatten it out, be careful not to dent or scratch the picture. *make sure your holding the line, getting it back out is NO fun. You will find two small holes in the cover of the ornament, where the wire runs through the cap. Poke the ends of your fishing line through the holes (one in each side), slip the cap back onto the ornament, and tie off the fishing line. I like to knot the strings multiple times to ensure it will not come undone. Complete your ornament with ribbon of choice (mine is May Arts Wrinkled Silk), or simply add a hanger. 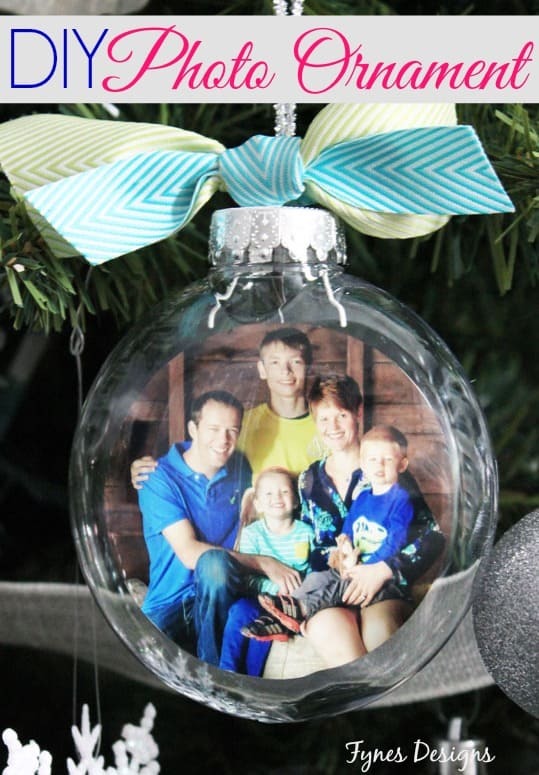 Gift, or hang your DIY Glass Photo Ornament for all to see! Its safe to say this maybe the only glass ornament craft I ever share… they are incredibly hard to photograph! What do you think, will you give it a try? You know Grandma, or a close friend would love to receive one! So cute! I have a few glass ornaments waiting for inspiration, and this is perfect! I love these! I’m definitely going to make some this year. 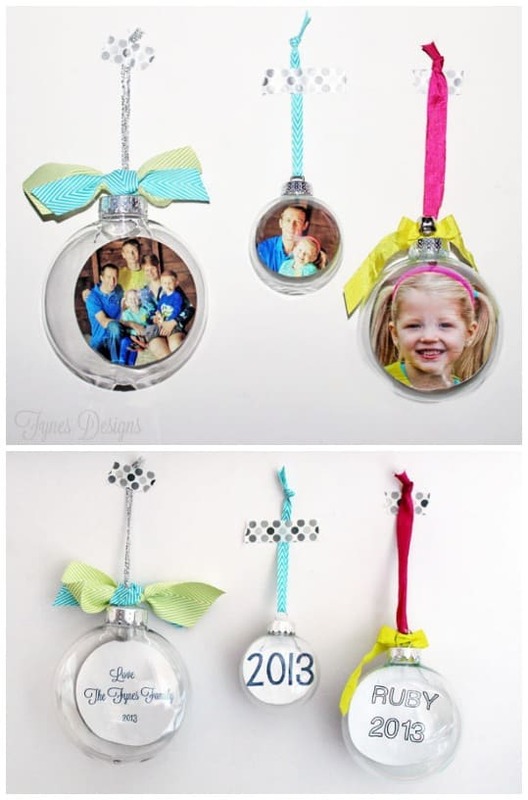 Where do you get your clear ornaments? I’m hosting a link party and would love for you to link up this project. You can pic them up at Michaels, Walmart or the dollar store! Happy crafting! I LOVE the ornaments Virginia!! I’m going to attempt to make some too! Thanks for the tutorial. These are so cute Virginia – I absolutely love them! Pinning!! I can’t get my picture to uncurl do you have any suggestions?? Hi Tiffany, Use a Q-tip to poke at the center of the photo, it shouldn’t damage the photo so you can give it a bit more push. The thinner the photo paper and cardstock the better. I hope this method helps. Thanks for stopping by! Great idea–and best of all, CHEAP! 🙂 I definitely want to try it. Thanks so much for sharing. Merry Christmas! What a genius idea I’m going to try this thanks Virginia for sharing your idea with everyone. That is SO great Roseanne! Thats what I hope for! When I was a kid we had engraved ornaments, we were so excited to find ours on the tree after it was decorated! I’m so happy I found this! I have been looking all over for the best possible method for doing this and yours is the first that explains it the best. I’m doing one for each member of the family a picture of my grandpa who passed away in October from cancer. I tried a sample picture rolling it up to insert it in but when it’s in the glass, it seemed to not wanna straighten out. Will the card stock help with this problem? The bigger the bulb the easier it is to get the photo to straighten out, because it doesn’t have to roll so tightly (the loser you can roll the better). I don’t know if the cardstock makes a difference, I’ve never tried without. Using something with a soft end like a q-tip or paintbrush will let you apply a bit more pressure without damaging the photo. Good luck! I love this idea and made some today! My boyfriend and I are putting up our first Christmas tree this year and I wanted to start a tradition for our tree. I made 4 (one for each year we have been together). Hope to make more in the future as we grow older. It will be a cute reminder of how much we have changed over the years and if we add any new members to our family that year! So glad to hear Mel! I love looking back at ours, crazy how fast the kiddos grow! Do you put the card stock on the back of the photo? I would like to print this , I don’t seem to be able to. Would someone please help me? WHat did you want to print Bobbi? Instead of card stock, I sandwiched the fishing wire in between the back of the photo and a piece of green tissue paper. It was thin so it rolled and unrolled easily. I also had my students rip up tiny pieces of red tissue paper for inside the bulb as well as some white glitter (snow like ) which stuck to the inside of the glass. It came out colorful and beautiful! I cut up thin strips of clear transparencies (used for overheads) and they wrote a message (Merry Christmas, I love you mom and dad, etc. or 2014) with a Sharpie and put them inside the ornament. Very unique and awesome! Great ideas, I bet they turned out awesome! I make these using transparent paper. The transparent paper rolls up and unrolls easily and you can see the picture on both sides. I tried this and it didn’t work at all…. and I’m pretty good at crafts. The picture wouldn’t unroll AT ALL and unfortunately I spent the last of my money getting these as Christmas gifts for everyone….so there goes Christmas. And it wasn’t the card stock, because I used regular paper that I printed out and cut…it doesn’t get much thinner than that. What size picture did you use? I have a 3.25 inch ornament and I’m not sure what size picture would be good! I started with a 4×6 photo, but just cut it down to the appropriate size. What a wonderful idea! I have all year to make these for relatives and friends for Christmas 2015. Thanks for sharing. I’ve made many of these in years past, but I printed my pictures on transparency paper, and cut the photo to the exact size of the ornament, and it just sits in the ornament all by itself! It isn’t quite as easy to see, but it is a cool effect! I’ve always wanted to try that too! What size is your ornament? I’m not sure of the size, but can tell you not all the holes are the same size. Be sure to remove the top and check that your finger would fit in the hole before you buy! What size do you use for the bulb? You can use which ever, bigger is better becasue you don’t have to roll the photo so tight. I would like to make one o these for each of my Cub Scouts, but use an individual photo on one side and a group photo on the other. Do you think that would work?? Also, when I bought the ornaments I ran into another woman who was purchasing them too. She said she had made them last year and was doing it again this year. She also said she laminated the photos she used and tried to explain how she went about making her ornaments, but I didn’t quite understand her explanation! What do you think? Could I use two photographs, back to back and would it help to laminate them? I was also thinking of putting fake snow in with the photos. Would that work? Sorry my response is coming so late. The only issue I see is that when you rolled it the photo would kind of crack and it may be hard to get it flatened back out. Virginia, Carol Duvall did this years ago on The Home Show, HGTV. i never tried it, but she put the photos onclear sturdy plastic – like the clear lids on Xmass card boxes. she rolled them to to put them in the ornaments and they just popped open to fill the inside. i believe she measures like You did ~ with a glass the diameter of the ornament. back then, she used a bleach solution inside the ornament to remove the “coloring” ~ much easier now to buy them at a craft store! how times have changed! for the easier! i think this year, i’ll make them! did You tape the fishing line down with the double stick tape? i know You said “stick it in between the stock and photo” but is it taped down?